Soul’d Out Quartet announced the addition of Ian Owens as their bass vocalist yesterday. Owens is replacing Matt Fouch, who left recently to join Legacy Five. Owens comes to the group with an impressive resume, having sung with the Cumberland Quartet, the Imperials, and most recently Ernie Haase and Signature Sound. I mentioned when Owens announced he was leaving EHSS that I always thought he fit better with the Imperials than he did EHSS. I expect that Owens will fit with Soul’d Out quite nicely. Quietly, this quartet has assembled quite a vocal lineup. With Dusty Barrett, Matt Rankin, Bryan Hutson, and now Ian Owens, these guys can really stand toe to toe with the top tier quartets in this industry. I’ve been a fan of the group for a while now, and they have a bright future ahead of them. You can find the press release with quotes from both the group and Owens here. Congratulations to Ian and Soul’d Out! Legacy 5 announced yesterday afternoon that Matt Fouch, formerly with Soul’d Out, would be their new bass singer starting September 1. Fouch is an incredible bass vocalist that will serve Legacy 5 well. He has great depth with a nice cut and can sing solos extremely well. The press releases that hit the blogs yesterday were extremely classy, and I have to say that it serves as an example of how these changes SHOULD be handled. I hate to be late on this stuff, but I’m on a business trip in Florida, so you’ll excuse my tardiness. Congratulations to Matt and Legacy 5, and best wishes to Soul’d Out as they begin their search for a new bass singer. January of 2012 will mark a new chapter in my gospel music career. I will be joining one of America’s best new groups, “Soul’d Out Quartet”. In fact, the group was awarded “Horizon Group of The Year” (Favorite New Group) in the Singing News Magazine Fan Awards in 2010. Matt Rankin (lead), Dusty Barrett (tenor), Matt Fouch (bass) and Michael Howard (piano) make up “Soul’d Out Quartet”. I will share lead vocalist duties with Matt Rankin. 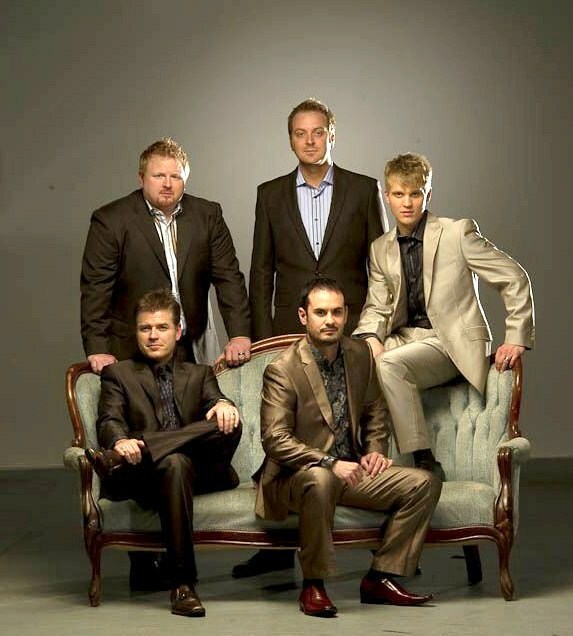 SOQT is a solid quartet who sings straight ahead Southern Gospel Music with a progressive sound. I’m very excited to see what God has in store for our future! Over the past several years, I have developed a friendship with members of the group. I believe the men of “Soul’d Out” are men of integrity and have a heart for ministry that mirrors my own passion. I know my friends and family will love the music and ministry of “Soul’d Out” as much as I do. My wife, Yvonne, and I have been seeking God and wise counsel about this decision and feel that this is a door God has opened. The tour schedule for “Soul’d Out” is a better fit for me as a husband and father. This opportunity will also allow us to reach our long term goals as a family. I joined my all time favorite group “The Kingsmen” in 1996 under the late Eldridge and Greg Fox. The 5 years that I spent learning from the Fox’s, the late Jim Hamill and Ray Reese were some of the best years of my life. Upon returning for my second run with “The Kingsmen” in 2007, we have seen lives changed through our music. I want to thank Ray and Brandon Reese and “The Kingsmen” for allowing me to be a part of the continuing Kingsmen legacy. I would like to ask for your continued support, encouragement and prayers for my family and both groups. I am looking forward to seeing each of you at upcoming “Soul’d Out Quartet” concerts. Please check our website for upcoming performances www.souldoutquartet.com . Bryan Hutson will be leaving the Kingsmen this December and will be joining Soul’d Out Quartet. While I hate to see Bryan leave the Kingsmen, as I’ve always loved him in the lead singer position with the group, Soul’d Out is one of the top up and coming quartets in Southern Gospel today. The arrival of a vocalist with the talent and reputation of Hutson may be just what sends them over the top into the upper tier of quartets. Prayers and best wishes to Bryan, Soul’d Out, and the Kingsmen as they begin the search for a new lead singer. In recent news, the NQC has announced their main stage schedule here. This has sparked some pretty heated discussion, as the Board cut down the number of artists on each night, and in doing so, eliminated some artists from the main stage altogether. By far, the elimination causing the most controversy has been the Dixie Melody Boys. Complicating matters is the fact that this year is the 50th anniversary of the Dixie Melody Boys, and the group had hoped to stage a “mini-reunion” with their set. A few of the other omissions are notable to me as well: Soul’d Out, Liberty Quartet and the Ball Brothers. I really feel like the Ball Brothers represent the future of SG music, so it’s a shame that they won’t be appearing this year, Liberty is the best quartet the average SG fan has never heard, and Soul’d Out is the reigning Horizon Group of the Year. The 50th Anniversary of the DMB is the most unfortunate situation though, and I hope that the NQC Board will find some way to get them a slot to allow them to celebrate such a milestone. That being said, look, the NQC Board is also really in a no-win situation here. Every year we hear complaints about how attendance is dwindling, and how the evening concerts continually run into the wee hours and are way over the scheduled time. The “stop light” and fines have helped some, but the concerts still seem to run long. Credit the NQC for trying to address the situation. The only real way to do so is to cut back the number of artists on the main stage each night. In doing so, someone is by necessity going to have to be left out, and the artists and fans be upset by their omission. If it’s the DMB, their fans would be upset, if it’s the Pfeifers, their fans would be upset, or the Primitives, or whoever it is. My suggestion somewhat dovetails with Kyle’s above, but I’d suggest setting aside 2-3 slots that are reserved for a single slot for the “second-tier” artists, and let them rotate years. Maybe one year you have the DMB, Primitives, and Chuck Wagon Gang, then the next year you have Liberty, Ball Brothers, and HisSong. You could even merge the two suggestions and allow the groups without a prime time slot to have the “opening” slots that year. Either way, the NQC Board is at least trying something, and there’s something to be said for that. I’d rather see them trying new ideas than to be content to turn a blind eye and let the status-quo continue.